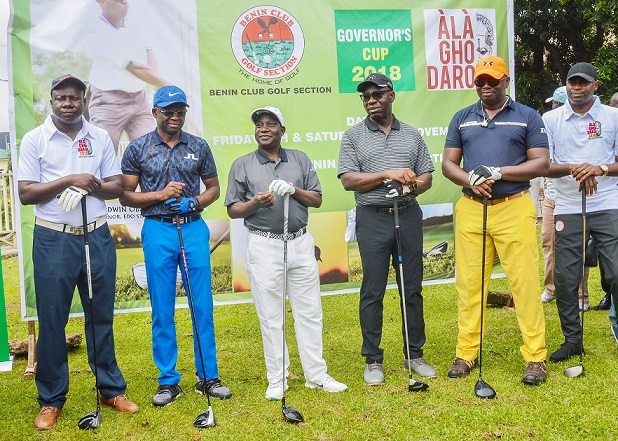 Edo State Governor, Mr. Godwin Obaseki, his counterpart from Plateau State, Simon Lalong and Deputy Governor, Edo State, Philip Shaibu, were on Saturday morning joined by other golfers to tee-off the Governor’s Cup golf tournament in Benin City. The golf tournament which started on an exciting note after the two governors made their entry into the Benin Club golf course, is part of activities marking the governor’s second-year anniversary celebration. Asked what his expectation was, ahead of the tournament that has him (Lalong), Obaseki, Shaibu and captain of the Benin Golf Club, Osagie Nehikhare in a team, Lalong simply said that he was in Benin City to defeat Obaseki in golf. A visibly excited Obaseki retorted that the defeat would be an uphill task to accomplish on his home soil. The event which witnessed strong corporate presence, is supported by leading real estate developer, MIXTA Nigeria, some commercial banks and major players in the agro-allied industry. MIXTA Nigeria is the Edo State Government ’s joint venture partner on the 1,400-unit Emotan Gardens estate project, initiated by the Obaseki-led administration.